Universal City, California, January 7, 2014 –Two decades after Jim Carrey and Jeff Daniels’ endearingly dense pairing spun slapstick comedy into box office gold in Dumb and Dumber, the long-awaited sequel, Dumb and Dumber To, arrives on Digital HD on February 3, 2015 and on DVD and Blu-ray™ Combo Pack and On Demand on February 17, 2015 from Universal Pictures Home Entertainment. 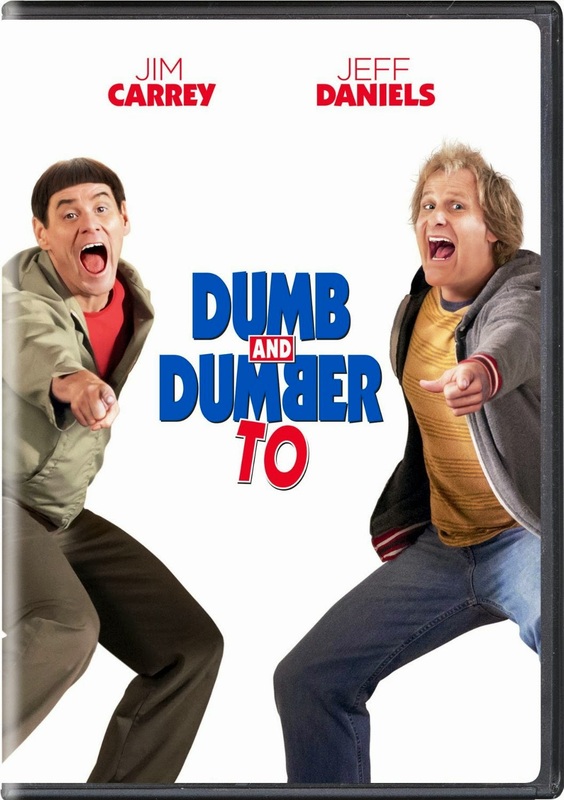 Directed by Peter and Bobby Farrelly (Dumb and Dumber; There’s Something about Mary; Me, Myself and Irene) the Dumb and Dumber To Blu-ray™ Combo Pack offers hilarious extra belly laughs including an alternate opening, deleted and extended scenes, and a multi-part feature that takes viewers behind the scenes of the no-holds-barred comedy. The side-splitting sequel also stars Rob Riggle (The Hangover, 21 Jump Street), Kathleen Turner (Marley & Me, Romancing the Stone), Laurie Holden (“The Walking Dead,” Silent Hill), Rachel Melvin (My Funny Valentine, “Days of Our Lives”), and Steve Tom (“Major Crimes,” Seven Pounds). What’s so Smart about Dumb and Dumber To? From stress relief to providing a new perspective on life, the film’s cast and crew and the author of Psychology for Dummies make the case for why you sometimes need to step back from the seriousness of life and just get dumb. Chapter 1 – “I Like it a Lot” – The Beginning—Join Jim Carrey, Jeff Daniels and the Farrelly Brothers on-set as they give you the hows, whats, whys and huhs behind making dumb magic all over again. Chapter 2.5 – “That’s Insane!” – The Cameos—Meet the fan favorites, powerful executives, brilliant musicians, and comedy legends who pop up throughout the film in surprising (and surprisingly dumb) ways! Chapter 3 – “We’re Gunna Need Some Wheels” – The Cars— Take a ride on the Zamboni, go inside the hearse, and discover the story behind the triumphant return of the Mutt Cutts van in this fun piece! Chapter 4 – “That’s Commitment!” – The Stunts— This chapter offers a high-paced peek into just a few of the hilarious stunts involved in the making of this movie. Chapter 5 – “There’s No Diamonds In Here” – The Editorial—Step into the edit bay with acclaimed comedy editor Steve Rasch (“Curb Your Enthusiasm”) to learn about how some of the movie’s most memorable scenes came together.